Lovely friends, this morning I’m supposed to be doing my Final Final Christmas Food Shop. 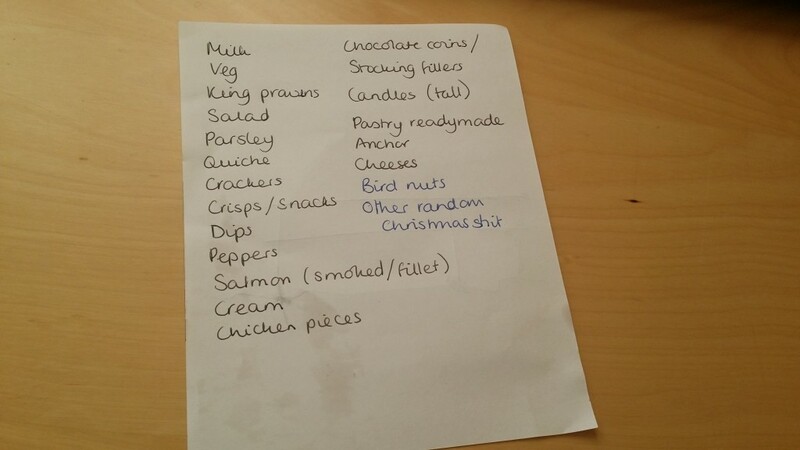 I even have a list, because as we all know, to go into a supermarket in the days before Christmas without a list is foolhardy. You may be able to sense my reluctance, given that I could have had it all done by now, and it’s 11:49 and I’m still farting about on my laptop (I AM dressed though, which let’s face it is a win). I’ve just been working on a guest post for the Author Advice section of my friend and fellow NaNoWriMo winner Donna-Louise’s fabulous blog Newshound to Novelist and I’ve been thinking about why it’s so hard to finish writing a novel. Without giving away anything too much from my post, I think it has a lot to do with confidence and being able to bring something to an end without knowing what it will lead to. Ending the first draft is tricky enough, imagine what it’s like making the final edits to a book just before publication? The pressure of having missed something (and the resulting shame when someone points it out in a review) is quite scary. It’s the same with the infernal shopping. Anyone else get quite anxious about it at this time of year? I’ve never once run out of anything, or not had enough food, or forgotten something which led to the world coming to an end, and yet every year I go through this state of panic. It’s partly because trying to get your normal groceries at the end of December has become something of an ordeal… even though I think it might not be quite so bad now I’m in Norfolk. It feels so much less stressful here. I read online that shoppers were trapped for hours trying to get out of Bluewater at the weekend and, having spent many a grim hour trying to escape from that place, I can well believe it. In Kent I seem to remember supermarkets opening 24 hours a day for the final week. Here in Norfolk, the local Sainsbury’s is open from 0600 till 2200 today, it’s closed on Christmas Day and then open again on Boxing Day. What’s the worst that can happen? Wish me luck – I’m off to get my Christmas shop. Wherever you are, I wish you a happy and peaceful Christmas, and lots of love for the end of the year. We’ve nearly made it – and we have so much to look forward to, my dears. I am reading my first book written by you , dark tide , I am so hooked you are a great new addition for me in reading, thank you ! Just finished reading Book 2 of the DSI Louisa Smith series and I loved it! Will there be a Book 3 in the future. Crime stories are my favorite reads and you are certainly on my list of favorites!